Whether you’re a Kraft Dinner aficionado or you’ve worn out the buttons on your microwave, most of us would love to improve our skills in the kitchen. There’s something wonderful about learning a new recipe or conquering a culinary challenge –especially the sizzling taste buds and satisfied stomach that come with a meal well prepared. So when you get the chance to learn to cook from someone who placed second at the World’s Association of Chefs Global Challenge, it’s an opportunity not to be missed! That‘s exactly what was served up to a few lucky folks when Serge Belair, the Edmonton Convention Centre’s resident Sous-Chef, turned our kitchen into a classroom and welcomed all comers to join him for a hands-on experiential cooking class. Participants of all ages and skill levels were invited to prepare a three-course meal together, whether they’d been cooking for years or had never owner a chef’s knife in their lives. But while this was a new and unique experience for the SCC, Serge certainly isn’t a stranger to teaching. Earlier in his career, Serge taught cooking classes to large groups at a Loblaw’s, showcasing his budding talents and helping others discover their own. The class at the SCC would be more intimate – something Serge appreciated. “Everyone really wanted to be there – you could just see that they were excited about it,” he shares. “When I’m up there teaching, I’m just being myself – I love cooking!” explains Serge. The class began with a masterful demonstration of different knives and tasks, and then it was time to dive in and get cooking. The group was split into three teams – appetizers, the main course and dessert. It was clear that nobody would be leaving hungry. Under Serge’s careful guidance, attendees were led step-by-step as they salted and sliced the meat, chopped up veggies and sharpened their knife skills while getting personal attention from a certified pro. Serge’s passion for cooking is positively infectious; the kitchen came alive as each group chatted, laughed and worked together to concoct dishes even Chef Ramsey would approve of. When the preparation was done and the lamb sat cooking in the oven, Serge took the opportunity to show participants around the SCC’s enormous industrial kitchen. 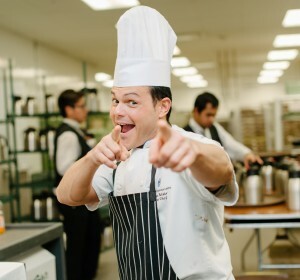 As they walked from station to station, Serge pointed out the top-of-the line tools and equipment available to the Centre’s cooks and explained how their busy team of cooks whips up meals guests that sometimes number over 2,000. An even better chef? We think that’s hard to imagine. We completely agree, and hope to see Serge in front of a class again soon.